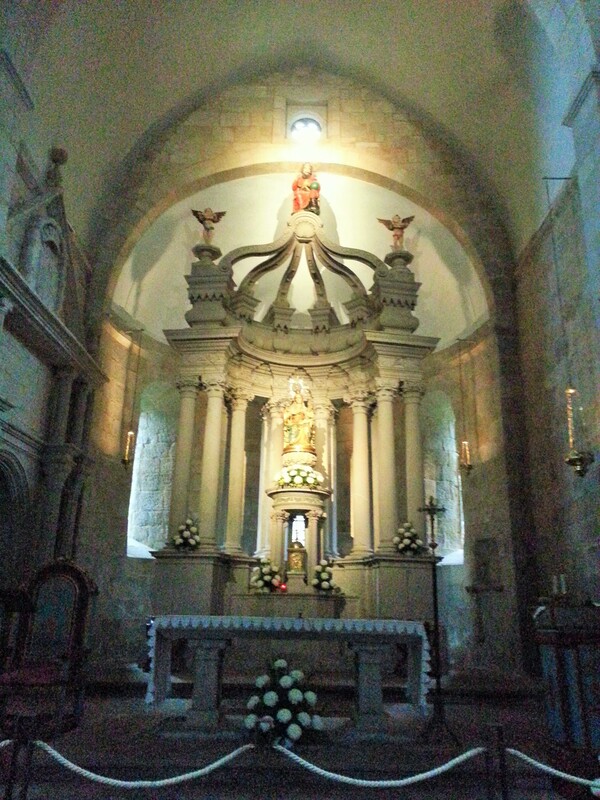 I travelled south after Santiago de Compostela and for my next stop deliberately chose somewhere which looked well placed as a centre from which to explore the popular tourist region of O Salnés. 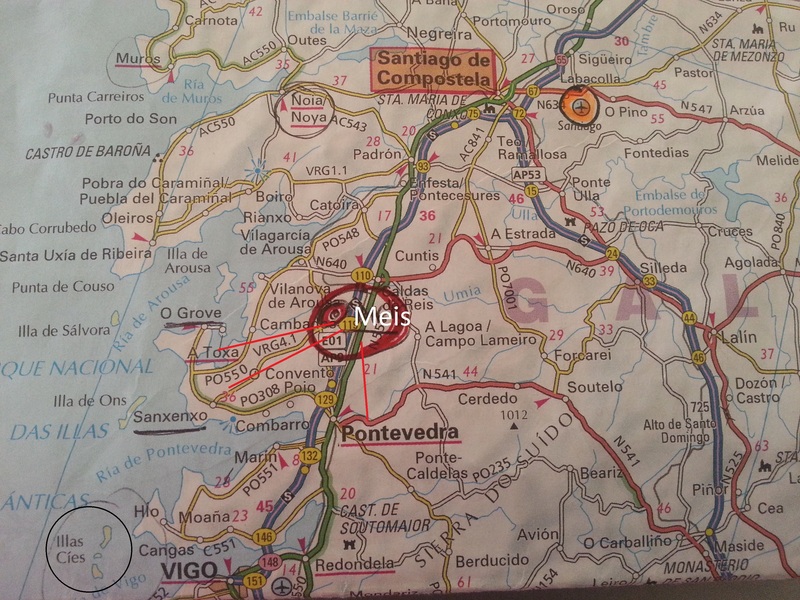 In every direction from little Meis I could reach small inland towns, coastal seaside resorts, and historic monuments in this beautiful part of Galicia. Though still relatively unknown by foreigners, thousands of Spaniards come here in the summer months for the blue flag beaches, the open spaces, and the unspoilt islands – particularly the Cies archipelago off Vigo which was recently voted by The Guardian newspaper as one of the 10 best islands in Europe and previously its Rodas beach as one of the 10 best beaches in the world due to its remoteness, white sands and the turquoise waters of its lagoon. This natural reserve is closed to visitors out of season and tourism restricted in summer (Guardian article). 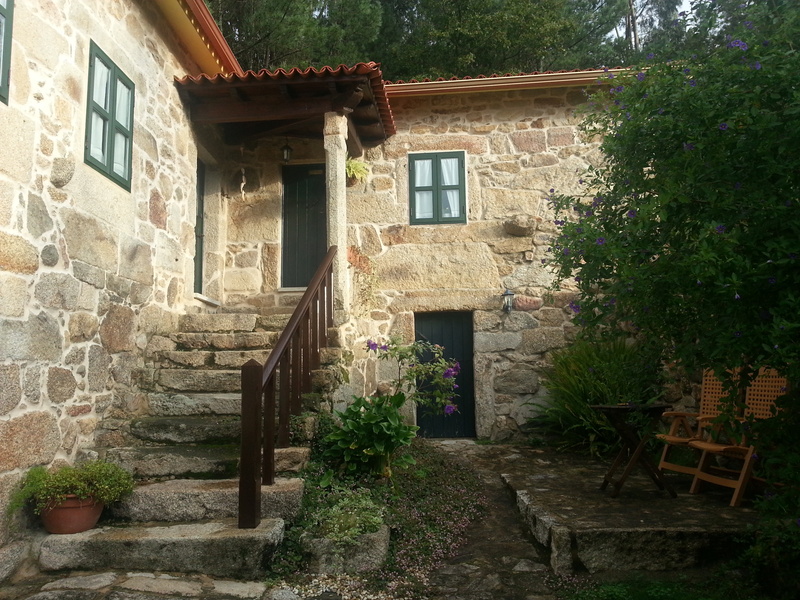 Arriving at Meis I wound through narrow tracks crisscrossing yellowing vineyards and eventually found Casal de Folgueiras, smiling with delight when I saw the attractive ‘casa rural’ which was built in 1680, complete with a traditional horreo grain store – by this time an ever-present emblem of Galicia. My hosts, Luis and Uxia welcomed me warmly to their enchanting stone-walled guest house and, telling me I was their only visitor, allowed me to choose my room. I felt drawn to the rustic room at the top of a stone staircase which gave a view from its door of the golden vineyards stretching beyond. They told me that I had chosen the ‘Room of Life’ where for generations women of the house had given birth. What an appealing thought, to sleep and wake where so many souls had entered this world. 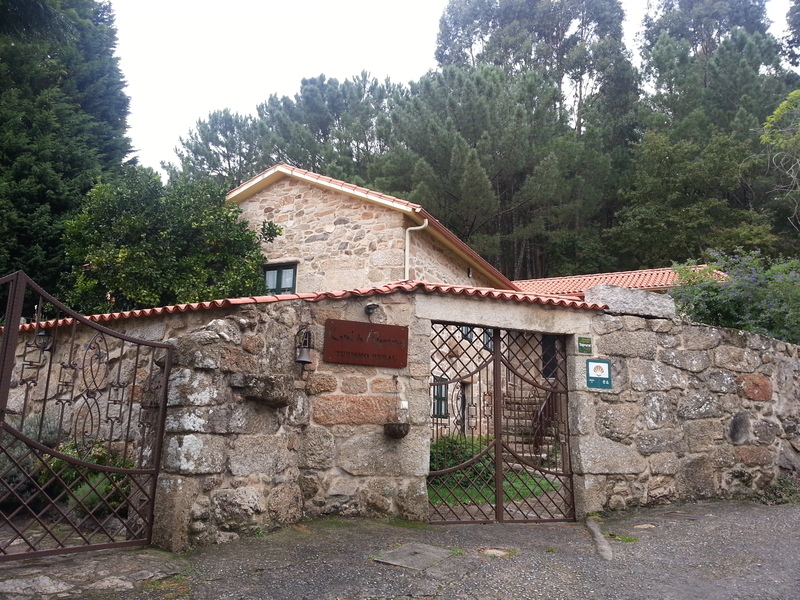 I was to spend many happy days at Casal de Folgueiras, using it as my base to explore the region. 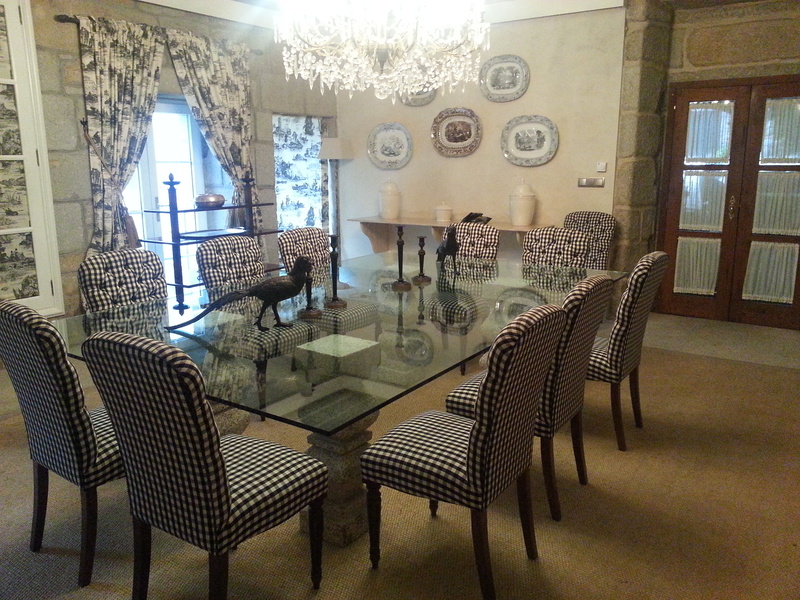 I had the five-bedroomed house to myself as my hosts lived off-site a few kilometres away. 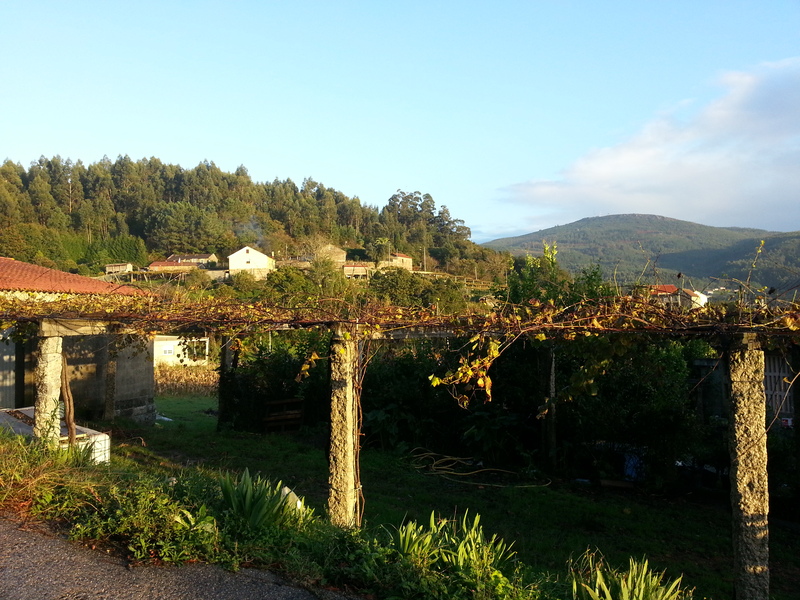 Each morning they arrived and prepared a homely breakfast for me as I looked out over the vines and chatted about life in Galicia, for example how schools teach both Spanish and Galician; how some families have to choose which language to use within the home; and their views on the ambitions of different regions for ever-increasing autonomy and independence. Each night I returned from my explorations to an empty house in the middle of nowhere, a dog barking somewhere in the distance or an owl calling. Letting myself into the room of life at the top of the stone steps under the moonlight I realised how spooked some people might feel in my place. I realised with some surprise that I was not at all afraid, something that I had not previously really known about myself. A pleasing discovery. Luis and Uxia were extremely attentive hosts. 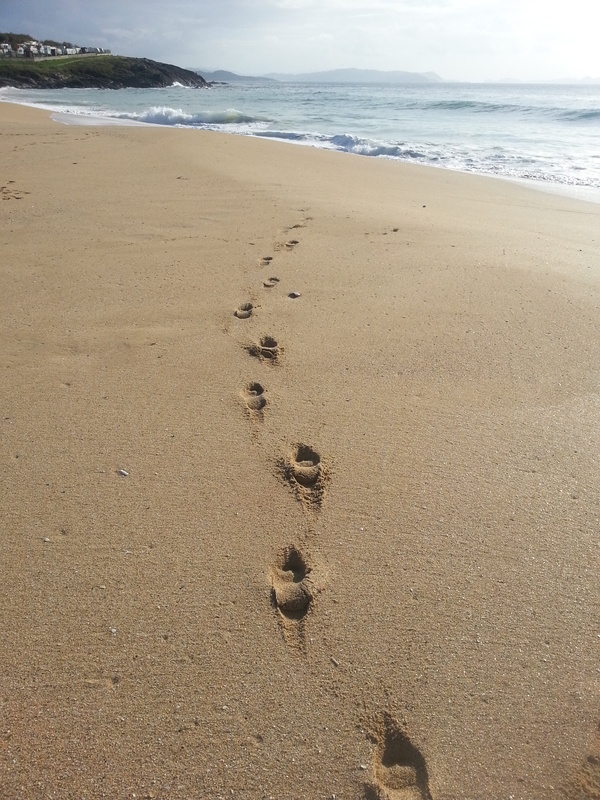 They gave me helpful advice each day about my itinerary, and took me themselves to places that I would not have found. 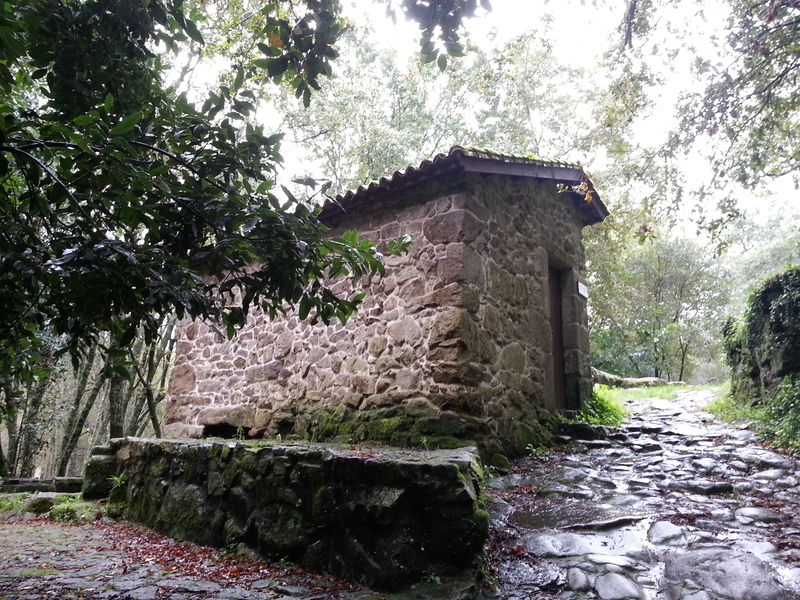 One was the wonderful ‘Ruta Da Pedra E Da Agua’, a stone-flagged forest walk where eight ancient water mills still sit at intervals beside the tumbling Armenteira river. Built centuries ago these small stone mills belonged to families, or several families who had the rights to mill their grain at certain times. 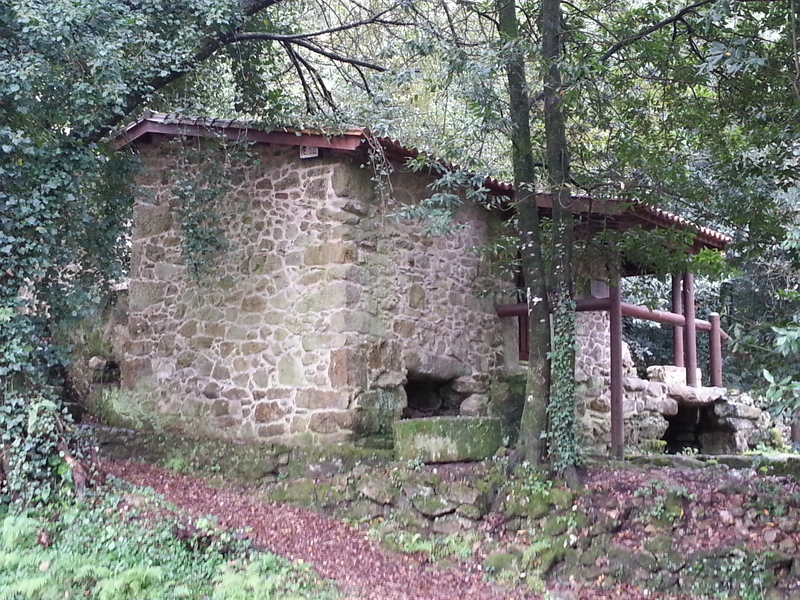 The mills are hereditary, called ‘molinos de herederos’, the rights passed down the generations. Luis told me that his parents’ had willed him the rights to a mill, though not one here. The mills, each with a charming name (e.g. El Gaitero; El Currucho), were fascinating as well as atmospheric, and the walkway calm and peaceful with just the sound of the chattering water. 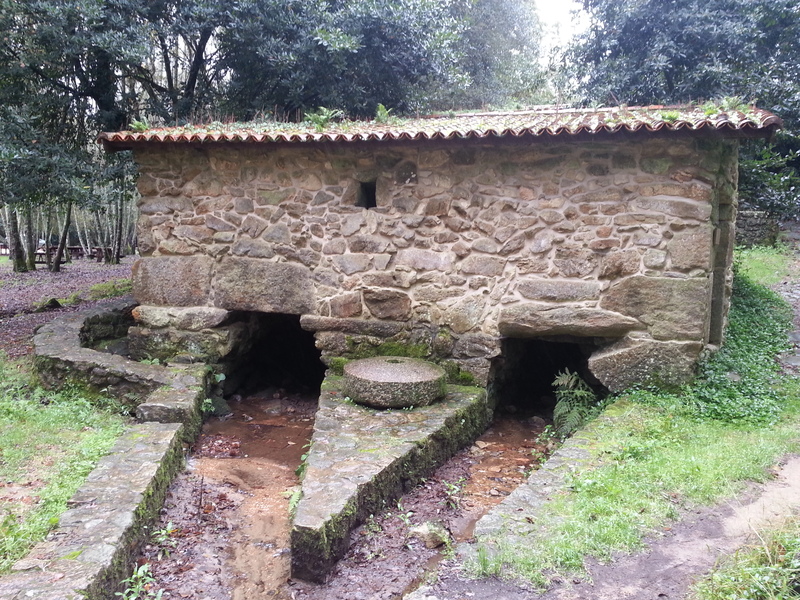 The mills are mostly ‘cubic’ with two water-wheels and two bedstones. 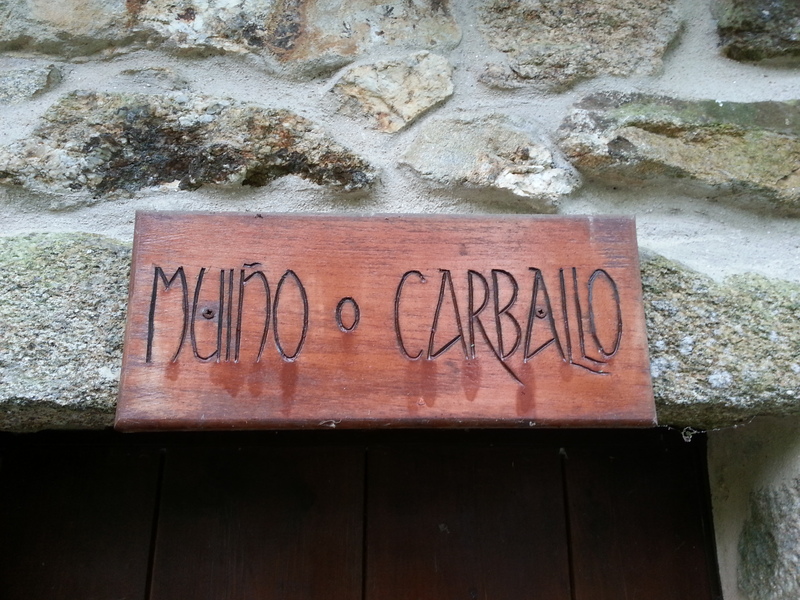 ‘Molino’ in Spanish, ‘Muiño’ in Galician. 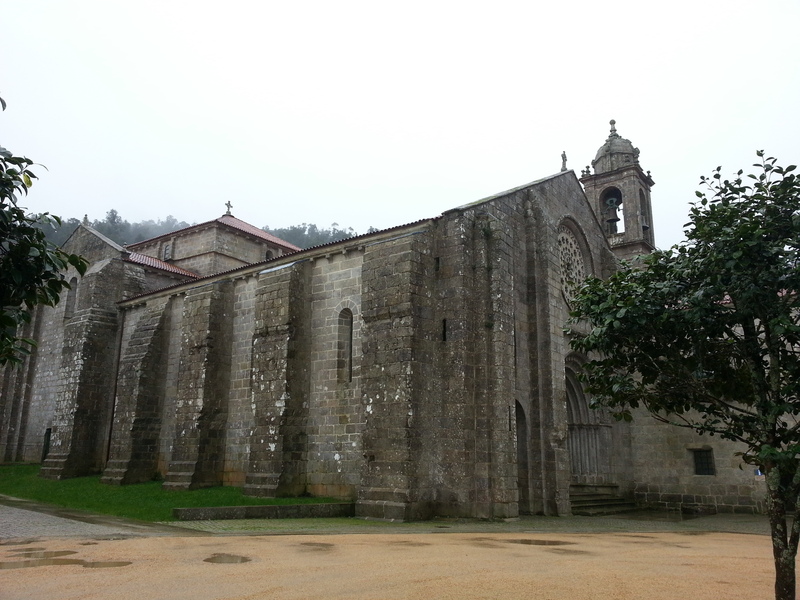 Walk far enough and you reach the 12th century church and monastery of Santa Maria de Armenteira, considered one of the most important historical monuments of its kind in Galicia, “a treasure of Galician art heritage”. 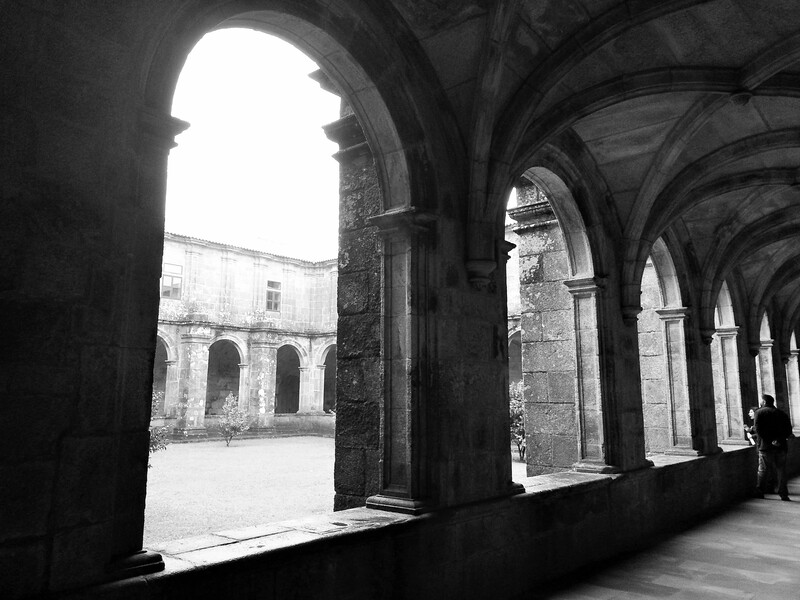 Here the cool cloisters of the monastery echoed the adjacent church bells as we strolled around them, and in the church who should be featured on a relief but St James? 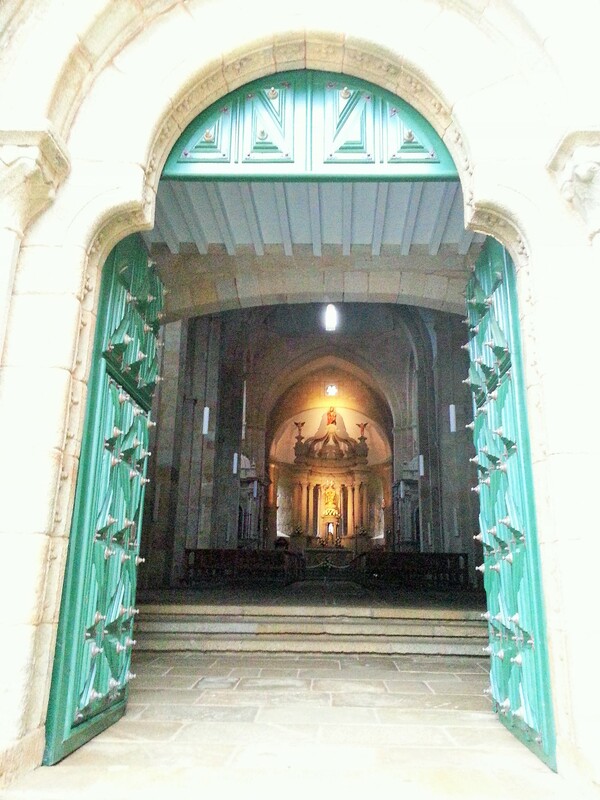 For I had discovered that I was still on the Way of St James, only in reverse, and would go on to meet several pilgrims who were travelling up through Portugal and Spain towards Santiago on the ‘Camino Portugués’ from Lisbon. 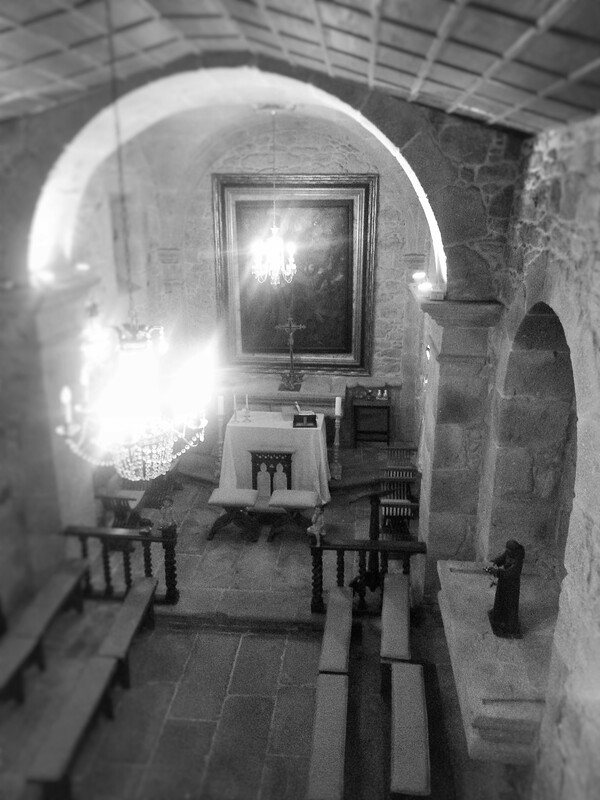 There is a myth that the monastery was founded by the knight St Ero in 1168 after being visited in dreams by the Virgin Mary. He then fell asleep for 300 years by a fountain, captivated by sweet birdsong, waking to discover he did not know any of the monks. The first time traveller? 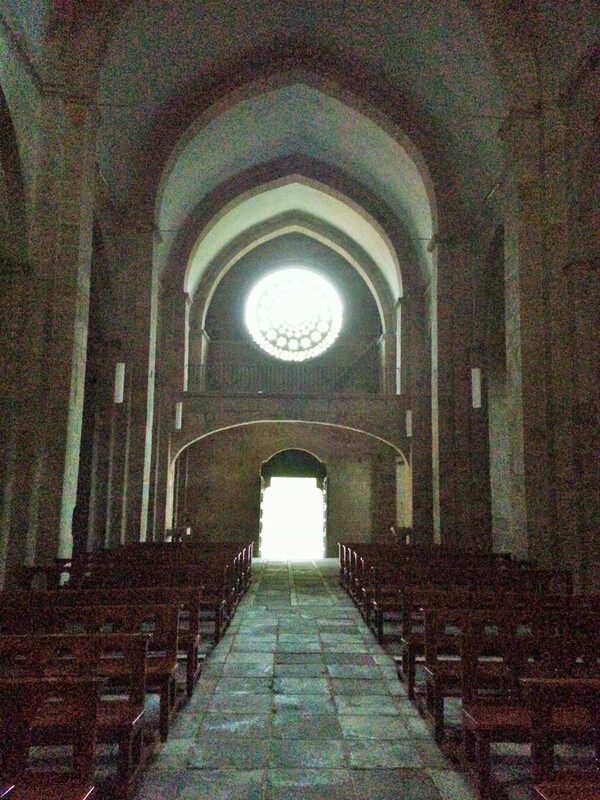 Looking back at the gothic rose window. 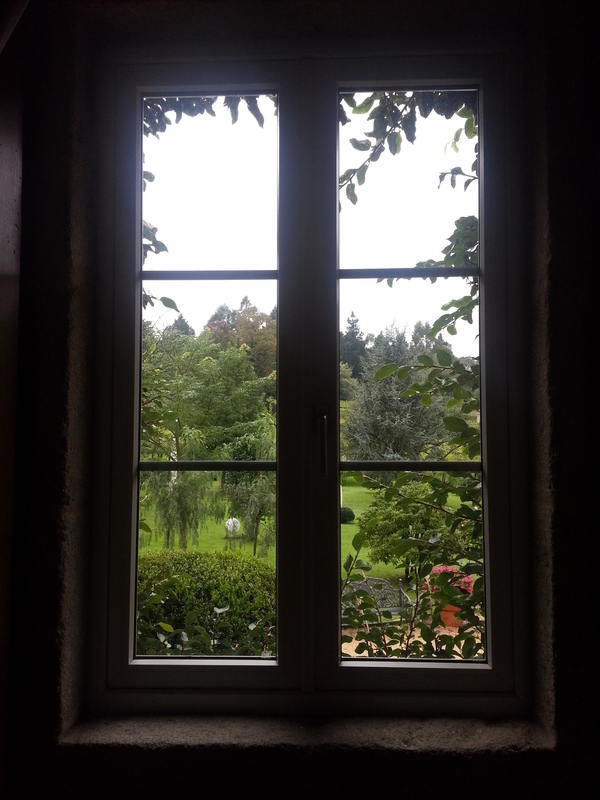 The abundant vines I gazed over from the room of life were in fact those of the Albariño grape which make the region’s Rías Baixas wines. Luis and Uxia were shocked that I did not know how fine and famous the wine of this area is, now considered one of the best in the world, winning many international awards. I admit that when I think of Spanish wine I conjure up blood-red Rioja but the Albariño wine is a crisp, white, seafood-friendly wine with “ample harmonious nuances and an elegant pleasurable complete aftertaste”, according to one brochure. It has grown in reputation in the last twenty years and is now considered Europe’s best hope to challenge the popularity of New World wines. You can travel around this area on one of several ‘Wine Routes’ taking in the vineyards as well as other cultural visits. 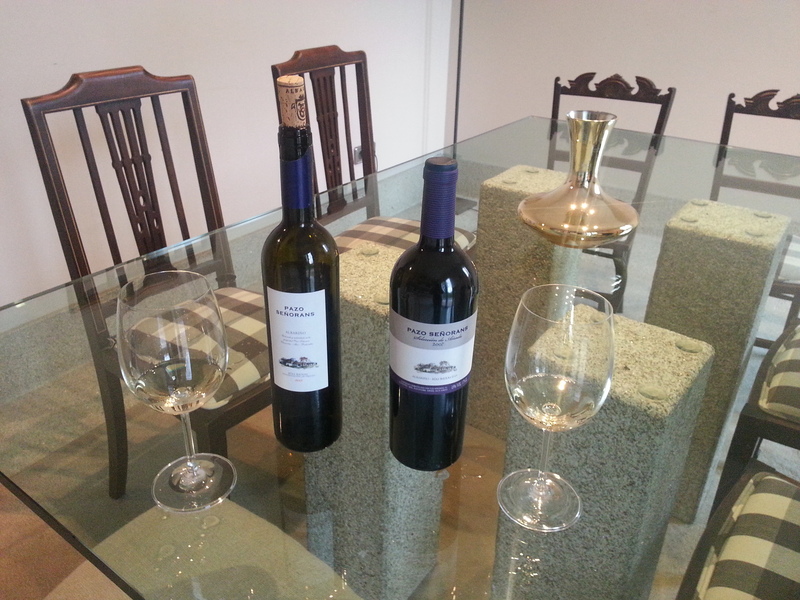 Luis and Uxia contacted one of the best vineyards in the area and kindly arranged for me to have a private tour. 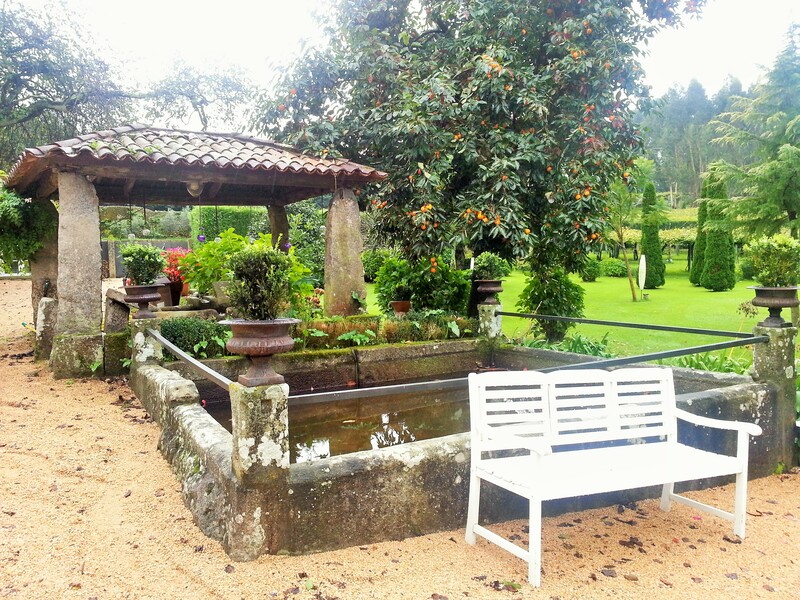 The sumptuous Pazo de Señorans vineyard was originally a 16th century manor house built by the nobility. My guide Javier told me that to qualify as a ‘Pazo’, these stately homes had to have in their grounds a dovecote, a chapel, an horreo and either a palm or fig tree, all of which Señorans has. The restored stone chapel was particularly emotive, though at one point it had fallen into ruin, lost its roof and been a pig sty. 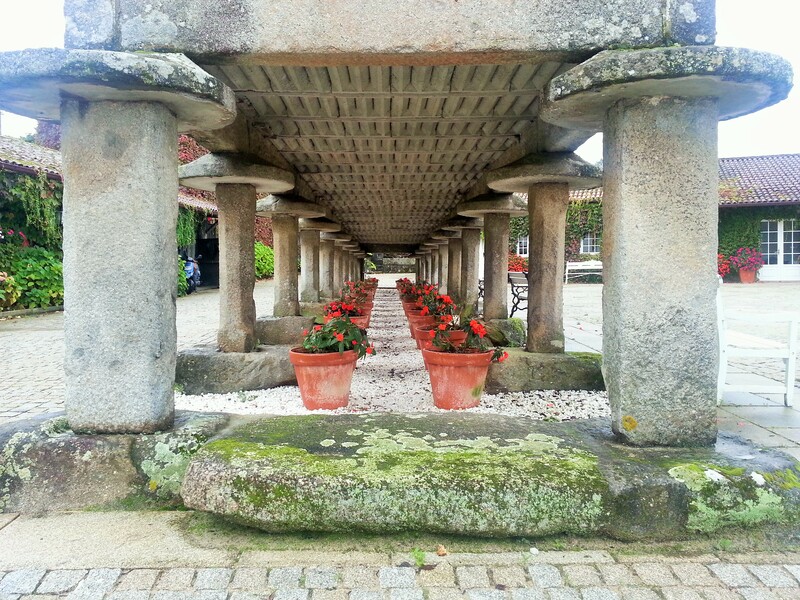 The stunning horreo in the courtyard was enormous, the largest I had seen by far. 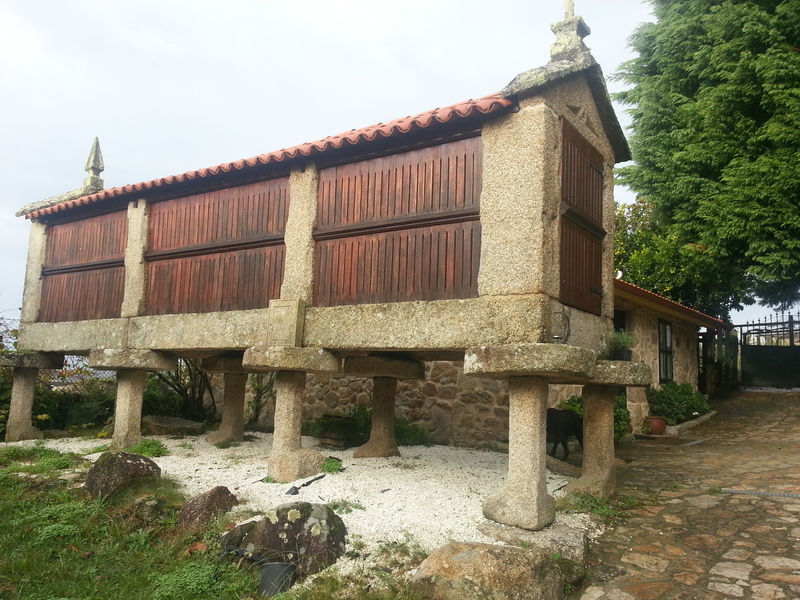 Again I was proudly shown how clever these raised granaries are, with their stone pedestals to deter rodents, rainwater troughs at their bases to deter ants, and slatted sides to allow the cool wind to blow the corn dry. 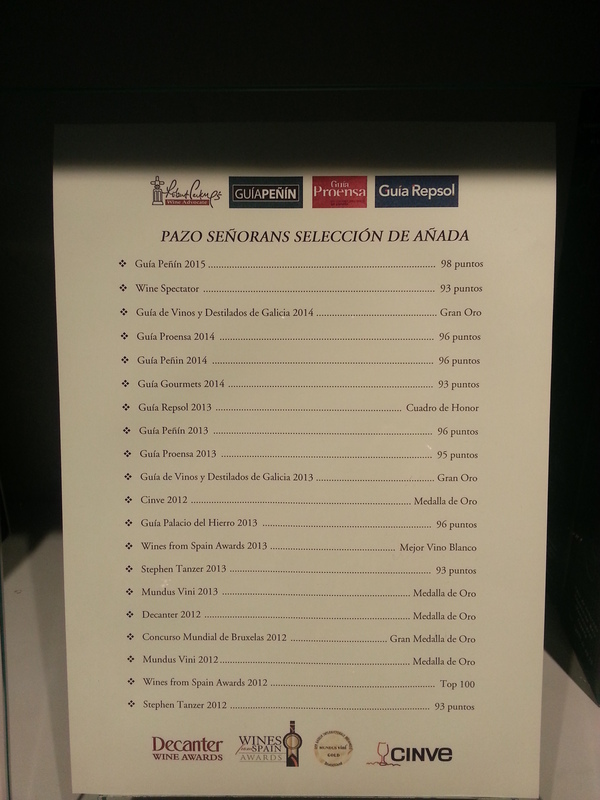 Pazo de Señorans is described as a relatively small vineyard concentrating on quality rather than quantity, its wines being well respected in guidebooks, winning numerous prizes. As well as cultivating their own vines they take in grapes from 500 external parcels, and Javier explained about the trust this entailed as the farmers are not allowed to pick the grapes until the company’s experts say so – even if it is against their own judgement or fear for the weather. 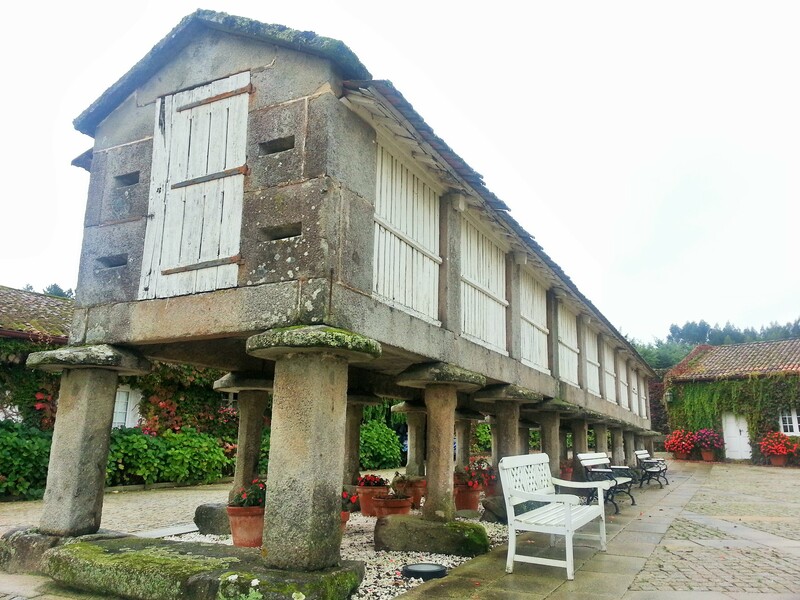 In the past some cultivators had lost their nerve, but now the Pazo de Señorans staff have gained their confidence. 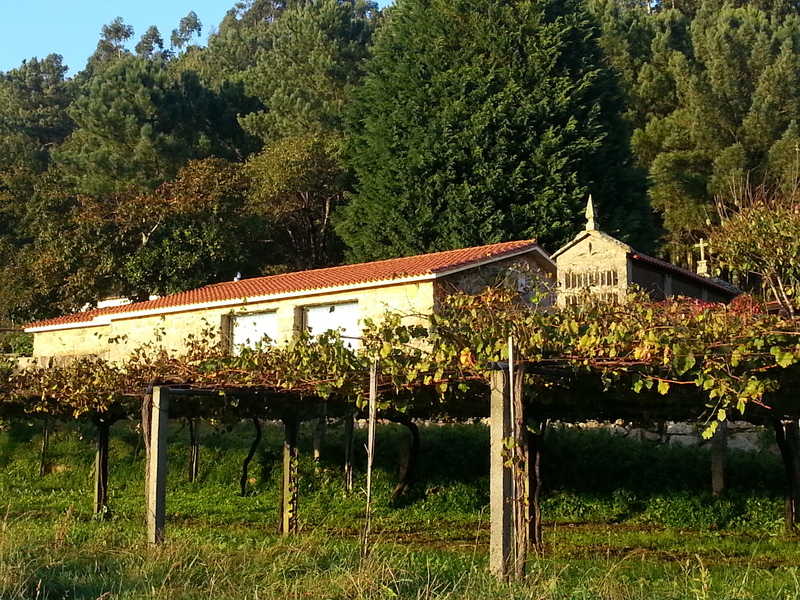 The pampered Albariño grapes are grown on pergolas to avoid humidity, so hang down from arches. They can therefore only be handpicked by reaching up. During la “vendimia” harvest time in September, neighbours help each other to bring in the grapes, aided by other local people and students. 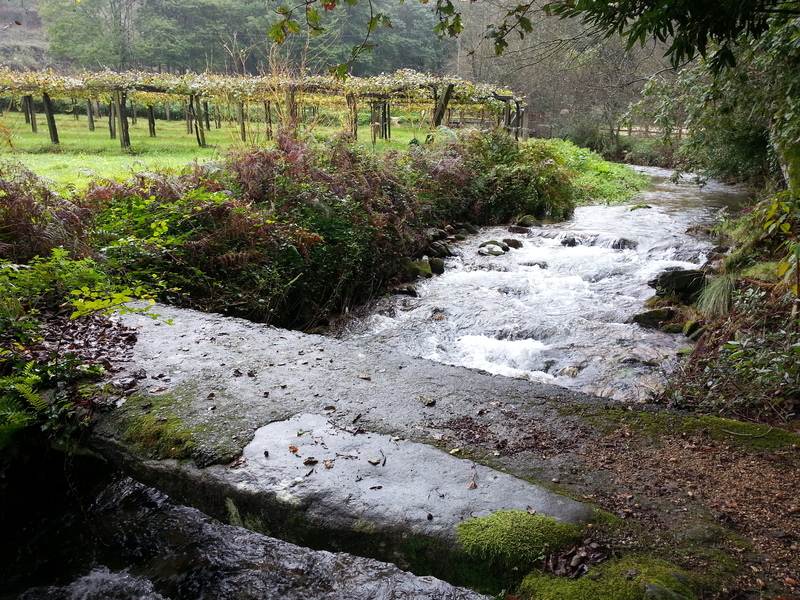 Wine has been produced on the estate for many years but the vineyard was set up as a company by the Bueno family in the 1970’s and is now run by their adult children. At some point the modern heirs decided to refurbish the manor house and hire it out for events, particularly weddings. 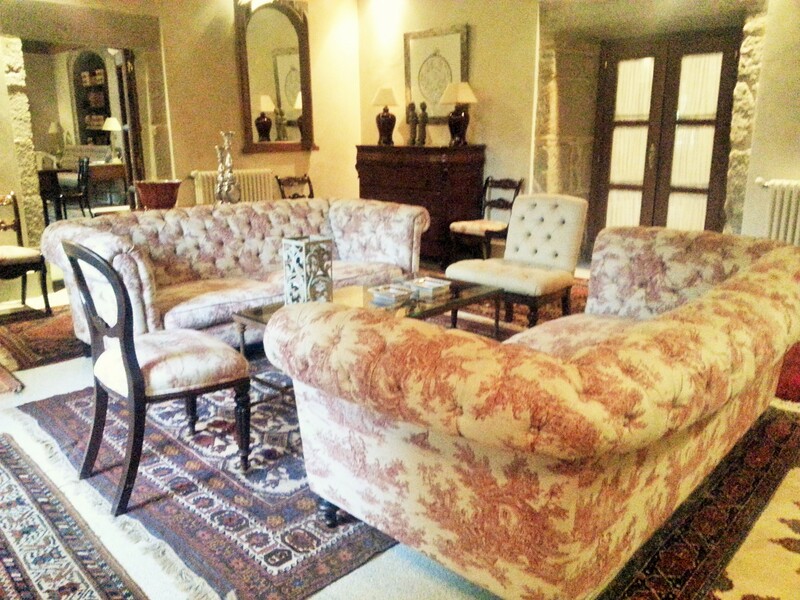 Now the interior is decorated in the best taste, and the grounds are beautifully groomed. It is a gorgeous property. 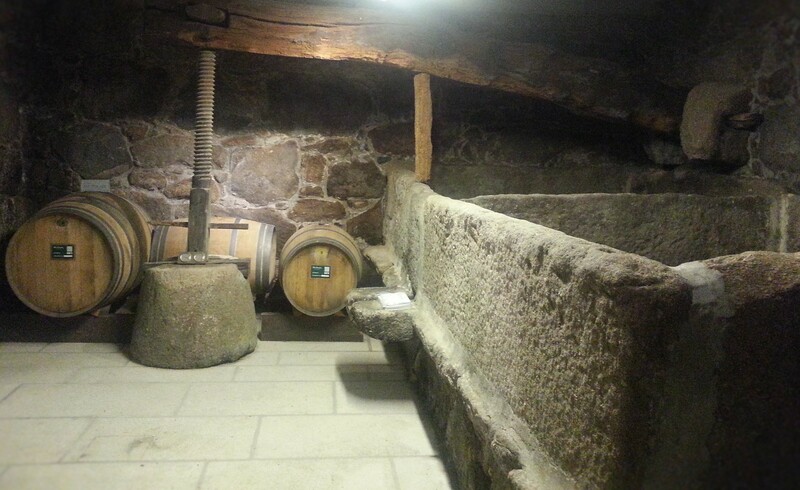 The new managers also modernised the winery completely but have kept the old copper vats and stone presses intact for show. 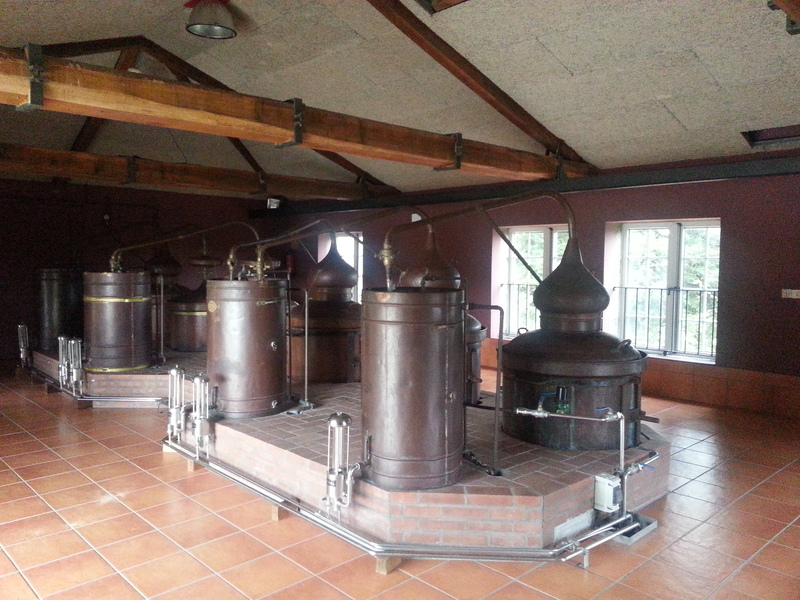 Javier explained the intricacies of wine making, how a grape has a head, heart and tail, and how they get to the heart after the first distillation, then to ‘the heart of the heart’ at the second. I did not understand this at all but loved the notion. 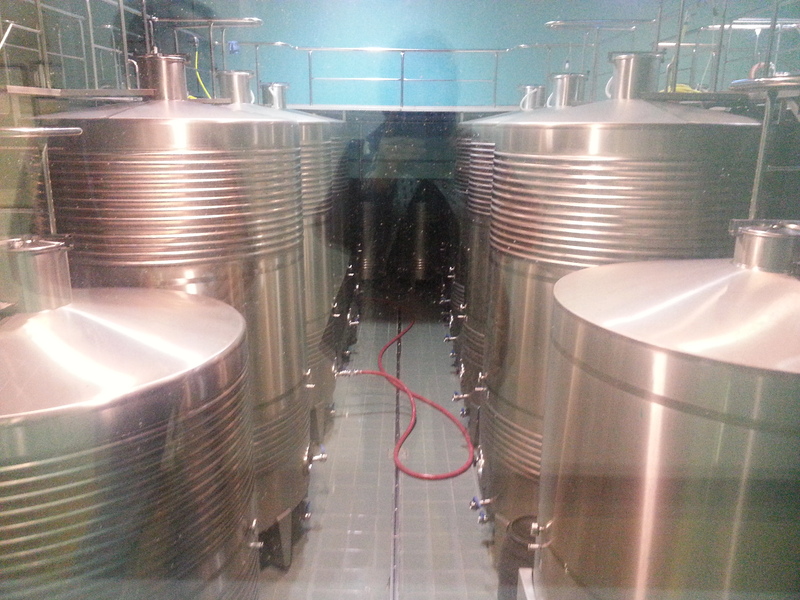 The state-of-the-art modern winery – and my ghostly reflection. 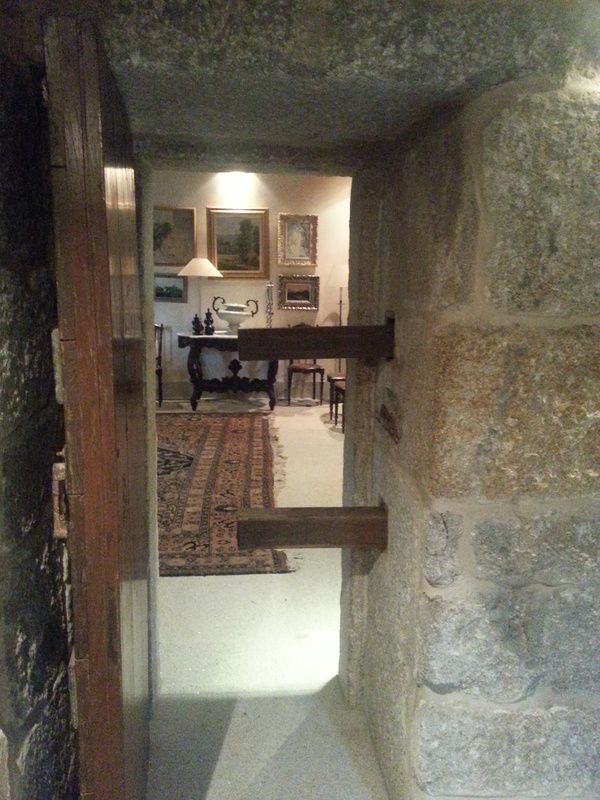 One small, thick-walled, stone room in the Pazo has an interesting history. It was a hide-out, an ancient panic room, where the door with solid iron reinforcements could not be opened by attackers. In addition there was a hidden cavity under the floor which could be used as a hiding place. Thick walls and reinforced door to the safe room. 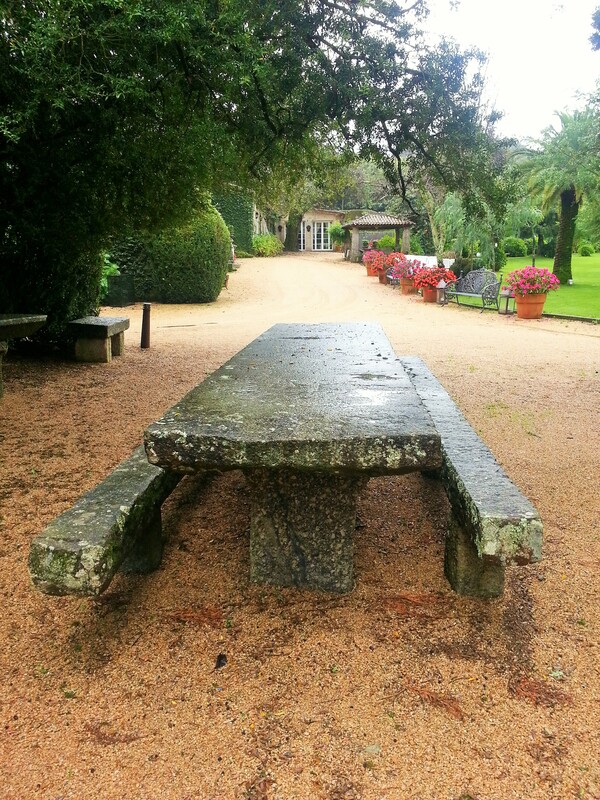 It is alleged that the last King of Portugal, Manuel II, hid here when he was escaping his country after the Portuguese monarchy was dissolved during the Republican Revolution in 1910. 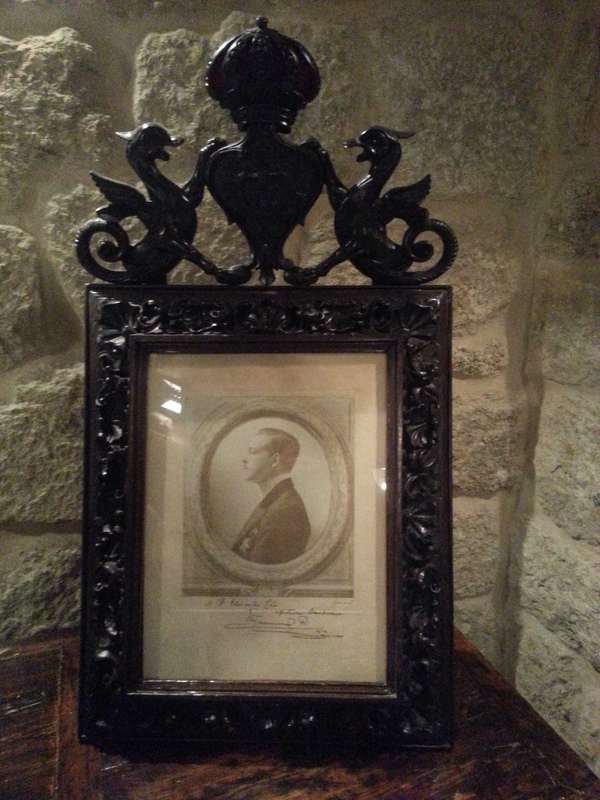 There is certainly a signed photograph of the King in the room, which the family claim was sent in gratitude. I could find no official reference to this online but it could be an unpublicised story. Records indicate that the King escaped Lisbon by boat, heading for Oporto but not landing there on hearing that it had been taken by the Republicans, arriving sometime later in Gibraltar instead – from where he was transported to England, living out his remaining days in exile in London. Did he hide in Galicia during those lost days between Lisbon and Gibraltar? The King’s thank you message? 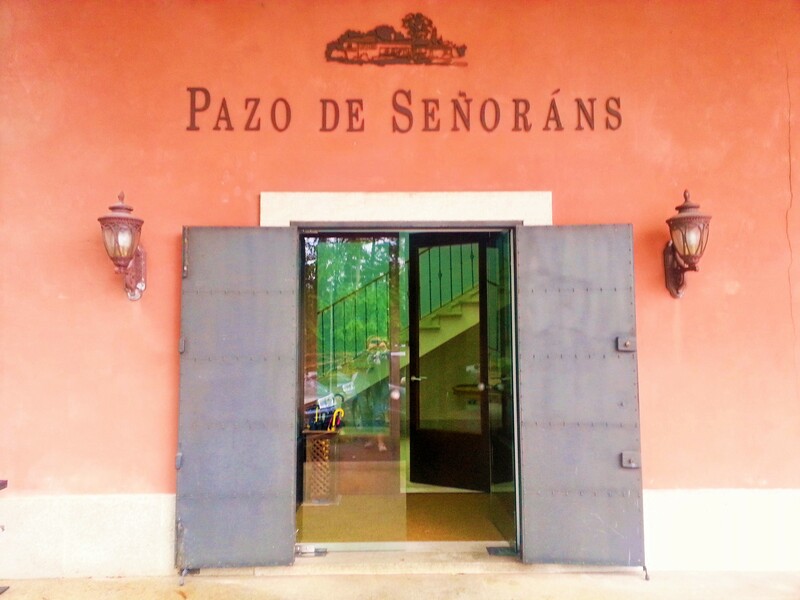 At the end of my informative tour I was taken to the tasting room where I came to understand why the Pazo Señorans wines have such an excellent reputation in the wine world. Javier patiently help me to distinguish the different flavours, even apple and rose petal (yes honestly), that are subtly present in this crisp wine, and to note how it lingers on the taste buds, being what is called in the trade a wine with a ‘long’ finish. Professional reviewers rate this wine extremely highly, also noting it aromatic fruit hints of either lemon, melon, or peach according to their impressions. 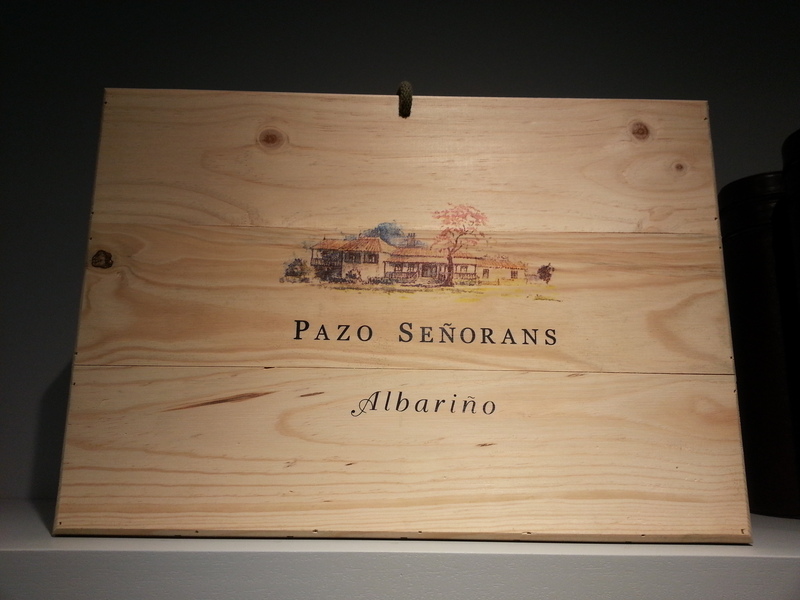 Numerous articles online assert that the Pazo de Señorans vineyard produces the best wine in the region and, though production has increased significantly over the years, it cannot keep up with international demand, especially from The United States. My free private tour had lasted around two hours. It had been a pleasure meeting Javier, like Luis and Uxia he had thoughtfully gone that extra mile to please me. So here in Meis I had been told about attaining ‘the heart of the heart’ whilst staying in the ‘room of life’. What was its message? I think my lesson was that the heart of wisdom in this room of Life is to find interest and joy in the things you chance on daily, to stand fearlessly independent yet still embrace the generosity and warmth of others you encounter in it. 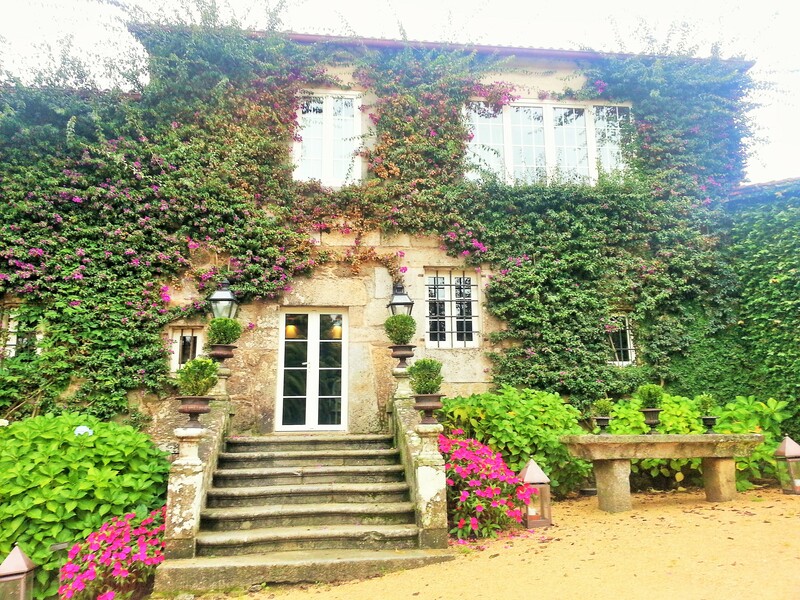 In my next post I will tell you about the places I explored whilst I stayed in the room of life, including Pontevedra, Sanxenco, A Lanzada and Cambrados. All delights. I shall not disclose how many glasses of Albariño wine I consumed, that remains my secret! Note : I have now completed this first Journey around Europe alone, and am back in my French home which borders Geneva, Switzerland. I still have to catch up on the stories of my travels so I will continue to write about them here.